1-3 business days. Price includes shipping! The Sleepypod Atom Pet Carrier meets major airline carry-on pet regulations for air travel and straps on both ends allow you to buckle it securely in your car for car travel. Sleepypod Atom is a modern pet carrier for everyday living that is consistent with the innovative design features for which Sleepypod has built its reputation. In designing Sleepypod Atom, Sleepypod took ideas from its multiple award- winning Sleepypod Air and applied them to the smaller-sized Sleepypod Atom. 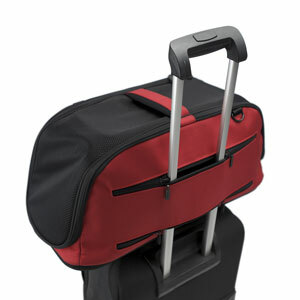 Air Travel: Top and ends are easy breathing dark mesh that opens for easy access. Pass through pocket to secure to telescoping handle on pullmans. Large pockets on both sides and both ends provide space for your pet's essential in-flight items. Car Travel: Straps on both ends allow you to secure the Sleepypod Atom in your car. Care: The plush cover on the removable foam bed is machine washable. The coated exterior and interior fabric is easily cleaned with a damp cloth. Just like all of our carriers and harnesses, Sleepypod Atom was crash-tested to assure your pets safety when traveling by car. Check out Atom’s crash-test video below. Ground shipping costs are included in the final product price. You will not be charged additional shipping fees for this item at checkout. This item will not count towards any free shipping promotion on other items in your order. In most cases, this item will ship separately from other items in your order. Certain areas and countries may incur additional shipping charges. If this occurs, we will contact you for approval prior to ship out. If you need expedited shipping, additional shipping fees may be required. If this occurs, we will contact you for approval prior to ship out. Click the button below to add the Sleepypod Atom Pet Carriers to your wish list.